Understanding when mushrooms typically come into season is very confusing. Most people know mushrooms as either wild or farmed. When you look in shops these wild and farmed varieties are available all year-round, this is because these so-called wild mushrooms are wild varieties that have actually been farmed. Mushrooms are like any other ingredient farmed varieties always taste different to those that have been left to their own devices in the wild. So what many people call wild mushrooms are in fact farmed and it is only the mushrooms that are foraged from the wild that has a particular season. Because true foraged wild mushrooms are very perishable and available only in season, they are often found at shops and supermarkets in a dried or powdered form rather than fresh. In this way they can be used as a seasoning. 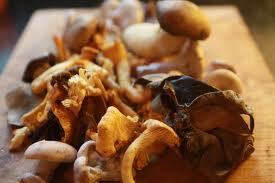 Wild mushrooms, either fresh or dried, are a great way to intensify a dish. Dried porcini or cepes, morels, black trumpets, and even chanterelles can be found bagged and ready to add to quick soups, or pasta sauces, but are also delicious simply cooked in a little butter, garlic and parsley and served on a bruschetta. They only require a quick re-hydration in warm water (a great tip is to save the liquid your mushrooms have been soaking in to use as a stock for soups, pasta sauces or risottos). Most farmed mushrooms are available all year-round, and many of them take different names depending on the stage of their growing cycle they are picked. For example, button mushroom begins life a pale white or light brown, then as it grows and darkens it is called a cremini, then as it ages even further and gets larger it is sold as a portobello. Other farmed mushrooms include oysters, enokis, and shiitakes. Mushrooms should be stored in the open so that cool air circulates around them. 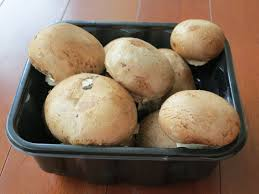 If your mushrooms are in a plastic bag or sealed container transfer them to a paper bag or a tray covered with a moist towel soon as you get them home. Mushrooms such as button mushrooms or chestnut mushrooms can be washed, but its best not submerged them in water for a long time, as they will soak up water and become soggy and very unpleasant. The best way is to use a mushroom brush, or even a small soft bristled paint brush, to remove debris from foraged and farmed mushrooms, or wipe with a towel. When cooking mushrooms it is important to cook them until golden, this will maximise their flavour. The best way is to use a hot, well-oiled pan and remember that more flavour will be extracted if they are browned before adding them to a sauce or dish. Season them to taste with salt, pepper, and fresh herbs. But a great Italian tip is a sprinkling of fresh lemon juice to liven up the mushroom flavour. All mushrooms taste delicious when you simply saute them in a little butter and olive oil with herbs (butter has a low burning point but by mixing with olive oil your butter will not burn so quickly when cooking). But certain mushrooms benefit from certain cooking techniques to enhance their texture and flavour. Button mushrooms, chestnut mushrooms and creminis are very versatile and can be sliced raw into a salad, sauteed quickly in butter and oil, or stewed slowly in a soup or stew. Portobellos are best grilled or oven-roasted. Most wild or foraged mushrooms, such as porcini, morels, chanterelles and so on, are more delicate and are best browned quickly to preserve their flavour. They get soggy and limp very quickly if overcooked.